If you are looking for an eco-friendly low-slope roofing system for your home or business, you have probably come across the fact that there is no green option in the flat roofing market. The only truly green roofing material is metal, as it is not dependent on oil, has a long service life of over 50 years, and can be 100% recycled. Unfortunately, a metal roof is not an option for low-slope applications. So the question is, which roofing system should you install as an environmentally conscious consumer? Our 3-Part Guide analyzes the environmental considerations and impact of all available low-slope roofs: EPDM Rubber, Asphalt Shingles, Built-up Tar and Gravel, Modified Bitumen, TPO, and PVC. When all factors, such as the manufacturing process, energy efficiency, longevity and recyclability are accounted for, PVC roofing membrane stands out as the least environmentally offensive option. As it turns out, the roof on your home or business can be a significant contributor to pollution and global warming. This is especially so because most roofs take a lot of energy to manufacture, are dependent on oil or its by products in their composition, are not energy efficient, cannot be recycled, and end up in our landfills. Consider this staggering statistic: the U.S. Environmental Protection Agency (EPA), reports that construction and demolition debris accounts for more than 136 million tons of waste each year, which is 40 percent of USA’s annual total. Out of this amount, commercial and industrial roofing accounts for about 4 percent (5.5 million tons). 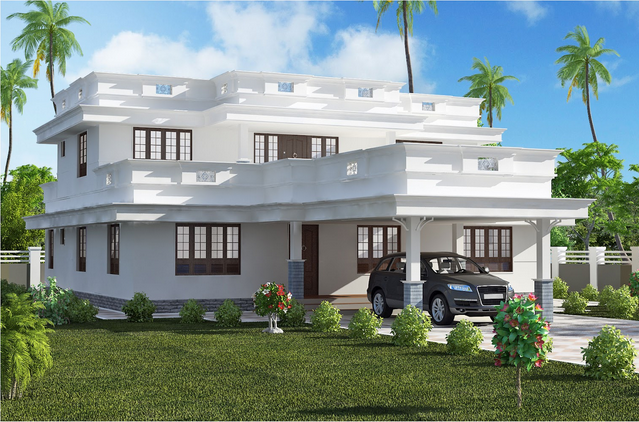 Therefore, if you care about leading a greener lifestyle, it is important to choose a roof that will have the least damaging impact on the environment. EPDM Rubber (Ethylene Propylene Diene M-class) is a single ply roofing membrane that is mostly composed of oil based substances. Ethylene and propylene are byproducts of oil refining, making up about 97 % of EPDM membrane. 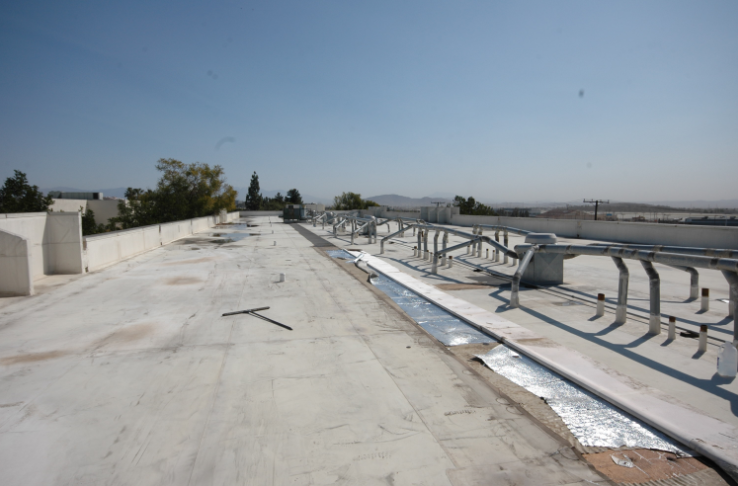 An EPDM roof has a fairly short service life, only (7-10 years), often fails prematurely, and is not energy efficient. Despite these facts, EPDM continues to be one of the most commonly installed and disposed of roofing materials, because it is significantly cheaper than most other roofing options. When it comes to recycling, current advanced recycling technology and grinding equipment actually makes it possible to recycle at least a portion of EPDM rubber roofs. Recycled rubber can provide black carbon and other minerals for reuse in a wide range of new rubber products. The EPDM Roofing Association (ERA) projects that about 113,500 tons per year can potentially have a beneficial end use if they were to be recycled. However, because of high costs, logistics, lack of recycling programs, etc., it is faster and easier to dump and old EPDM roofing membrane into a landfill. The EPA estimates that more than 1 billion square feet (185,000 tons) of EPDM roofing is removed and dumped into landfills every year. This is equivalent to 33,000 40-yard dumpsters! Being rubber, just like rubber tires, it takes about 10,000 years for an EPDM rubber roof to decompose. An Asphalt shingles roof is another highly popular roofing option because of its cheap cost, and it is also considered to be most polluting. Asphalt shingles are manufactured using heavy oil, or bitumen, and consist of 90% pure extra-heavy oil. Since manufacturing requires the recovery and processing of petroleum, it utilizes more energy than manufacturing of other none-oil based roofing materials. Moreover, asphalt shingles have one of the shortest life spans of all major roofing materials, sometimes as little as 4-5 years. During their service life, asphalt shingles do not contribute to the home’s energy efficiency, and in fact the dark color of the roof can increase your cooling costs by attracting more UV radiation and significantly increasing your HVAC load. When it comes to recycling, asphalt shingles recycling facilities do exist, but they are few and far between. Consequently, the easier route is taken, and old asphalt shingles roofs end up in landfills. It is estimated that around 30 billion pounds of asphalt roofing are taken to landfills every year. Built-up tar and gravel roofing is not a common roofing solution these days, and it is far from being eco-friendly. Manufacturing requires petroleum, as it is made up of 3-5 layers of heavy paper saturated in bitumen, and covered with gravel. The roof is put together with hot tar. This means that there is a hot-asphalt kettle present at the job-site, which emits poisonous bitumen fumes that pollute the entire neighborhood. Built-up tar roofing does not have a long service life (only 5-15 years), is not energy efficient, and does not get recycled at the end of its service life. Modified bitumen roofing is just like the others, requires oil in the manufacturing process, as it is made up of pure bitumen compounds. These compounds are modified with either plastics (APP) or rubber compound (SBS). 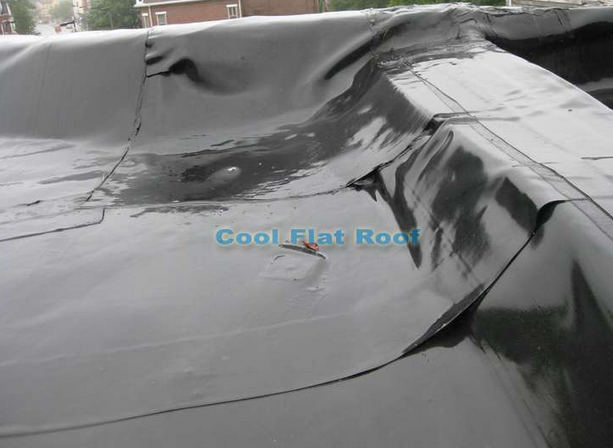 Modified bitumen roofing is reinforced with either fiberglass mats of polyester scrim. The installation process is not eco-friendly: the roof is installed in 2-3 ply assembly by either using a torch with open flame to melt asphalt, which then sticks to the substrate, or hot-mopped with liquid hot tar or asphalt, or cold-applied. 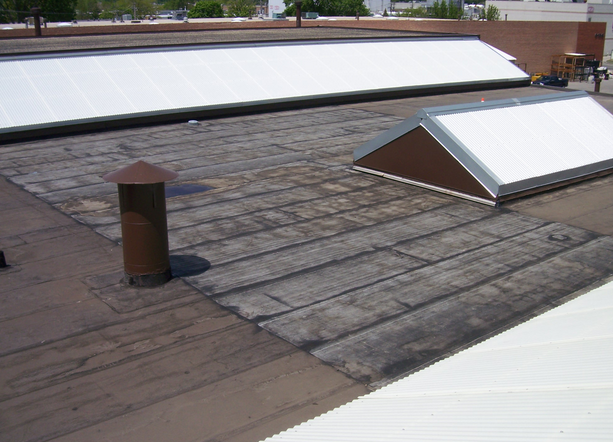 Modified bitumen roofs can offer about 10-16 years of service depending on the weather conditions, are not energy efficient and end up in the landfill. TPO (Thermoplastic Olefin) is made up of polypropylene and ethylene propylene polymers, and is usually reinforced with polyester. Ethylene is an organic gaseous substance, while propylene is a by product of petroleum refining. Other filler materials are added to the composition, such as talc, carbon filler or fiberglass. TPO roofs are Energy Star Rated as cool roofs, offering light color surfaces that reflect as much as 80% of sun’s UV rays. This reduces energy waste and significantly lowers cooling costs. TPO membranes can be recycled and are typically used in the manufacturing of new TPO membranes as the bottom ply. 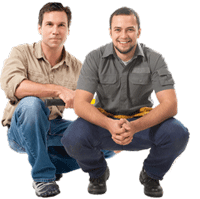 One of the biggest problems with TPO roofing membranes is their short, unreliable service life. Because TPO was designed to be a cheaper alternative to PVC roofing, the membrane’s chemical formulation has been altered numerous times to achieve the right combination of low cost and performance. Unfortunately, over its fairly short presence on the market (first introduced in the US in the early 1990’s), TPO’s performance has not been reliable, with documented roofing failures and mass recalls. The membrane’s chemical formulation continues to be worked on and improved, but its not possible to predict the longevity of currently installed TPO membranes. PVC (polyvynil chloride) is made up of only 50% fossil fuel (natural gas or methane). The rest is chlorine, derived from rock-salt. This means that by installing a PVC membrane, you can help reduce our country’s dependence on oil. 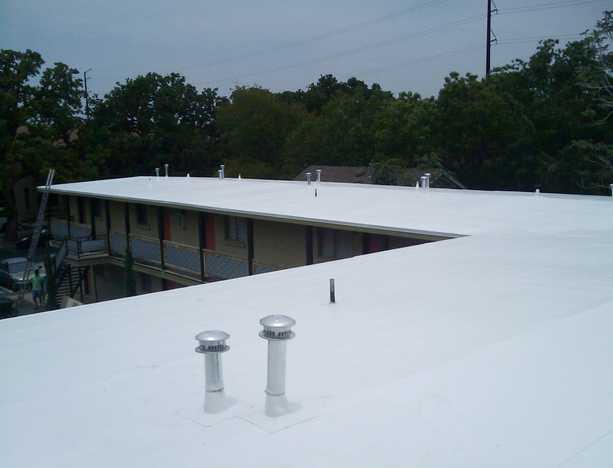 PVC membranes are energy saving cool roofs, and are Energy Star Rated for their reflective properties. By installing a PVC roof on your home or business, you will reduce your energy consumption and lower your annual energy bills by as much as 40%. In terms of longevity, PVC roofs offer the longest service life out of all low-slope roofing options. PVC roofing systems have a proven track record of service both in residential and commercial applications, lasting at least 20. Many PVC roofs in service today have been installed over 30 years ago. Because PVC roofing membranes are UV-protected and moisture resistant, they require virtually no maintenance throughout their long service life. 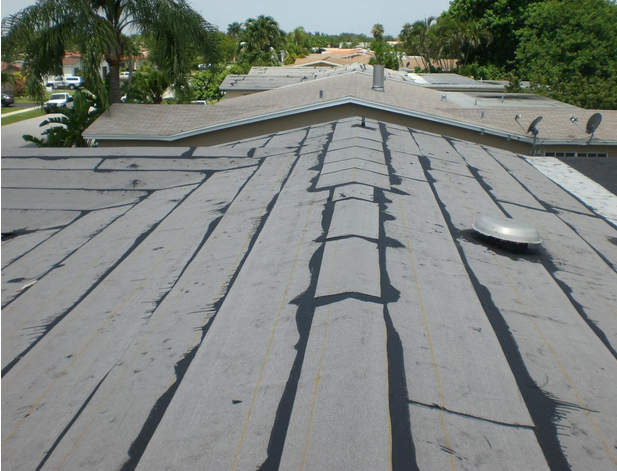 This further contributes to the conservation of energy, resources, and materials that are typically expanded to repair other types of low-slope roofing systems. When it comes to recycling, PVC roofing membranes are superior to the other single – ply roofing systems, because PVC is the only 100% recyclable material in the flat roofing market. In fact, the majority of PVC roofs are recycled, and go right back into the manufacturing of new membranes, as part of the bottom ply. Moreover, installing a PVC roof can help you avoid sending your old roof to the landfill. A PVC roof is so light weight that in most cases it can be installed right over the old roof, eliminating the need to dispose of it. A number of environmental protection agencies have raised concerns regarding the environmental safety of PVC roofing, because of the presence of chlorine and other substances in the membrane, known to be hazardous to human health and the environment. The reality is that these concerns are unfounded. Numerous independent research studies and government agencies such as US EPA and US FDA have confirmed the safety of PVC roofs both in manufacturing and during their service life. This issue is discussed in detail in our article: Addressing Environmental Concerns of PVC Roofing Systems.